An Android library introducing a stack of Views with the first item being flippable. Views inside the stack remain the aspect ratio of the FlippableStackView. For a working implementation of this library see the sample/ folder. FlippableStackView is based on the specific PageTransformer used with the ViewPager. Therefore to fill the View you can use just a typical implementation of a PagerAdapter. In your onCreate method (or onCreateView for a fragment), setup all the parameters of the FlippableStackView. Important Note: The current implementation of the library will display the elements from the Adapter in the reverse order. In other words: view at position 0 of your adapter will be displayed at the bottom of the stack and view at position adapter.getCount()-1 will be visible first (available for the first flip). 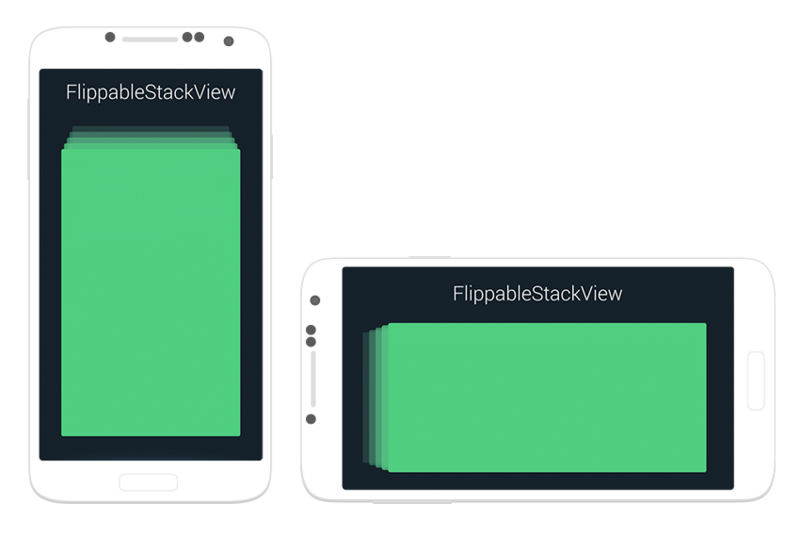 The FlippableStackView is highly customizable to provide you with just the visual effect you really wanted. Be sure to read about all the parameters in Javadoc before using the last one. Maven Central deployment was performed using an awesome Gradle script by Chris Banes. This made things so much easier.